Choose your share size and pick-up location in Blacksburg or Floyd. Weekly pick-up begins in June. We have a limited number of memberships available, secure your spot before we sell out. Each week we select items at the peak of ripeness. 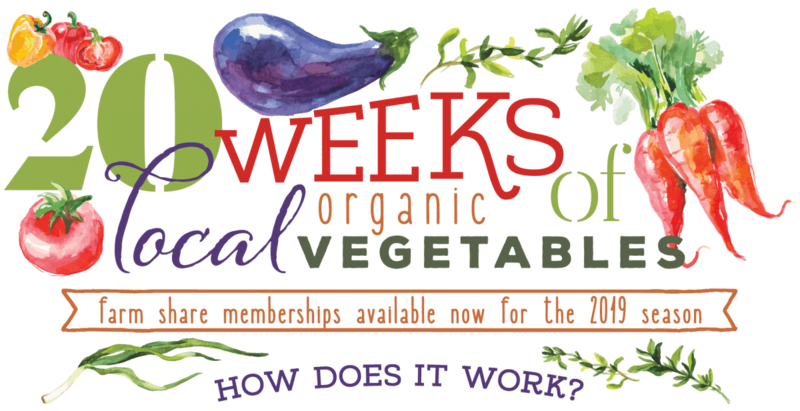 Login to our CSA webstore to see what’s in your share each week. Swap out items to get more of what you want and less of what you don’t. We want you to LOVE your farm share. Pick-up your share every week for 20 weeks! You will receive our weekly newsletter with the latest farm news, recipes and storage tips to help you get the most out of your farm share. As a member, you will receive a great deal on fresh produce in exchange for your commitment to our farm. We aim for farm share items to be 10-25% off market price. In addition, enjoy 10% off everything at our farmer's market stands and at our farm store. Enjoy member exclusive on-farm events including potluck events and some you-pick items. Going on vacation? Put your delivery on-hold for up to two weeks. Egg shares available for on farm pick-up. See options when signing up.